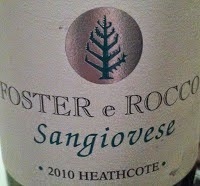 I tasted this wine from Foster e Rocco back in 2011 at a wine dinner with one of this label’s winemakers, Adam Foster. It can’t have been long after bottling I imagine, looking back at the dates. I found the wine good, and noted some attractive length on the finish and classic sangiovese flavours but put an asterisk next to its tannins, thinking them a bit hard. Fast forward to 2014, and the wine is lovely drinking. It has aromatics that remind of cherry, earth and wet roses. The palate is cherry and earth driven, with towards long length and is savoury and very balanced in the glass. This is one the better expressions of Australian sangiovese going around and it eschews the more typical full throttle expressions of Heathcote terroir.